Close up of hands of a man playing a drum. Close up of hands of a man playing a drum. Slow Motion. 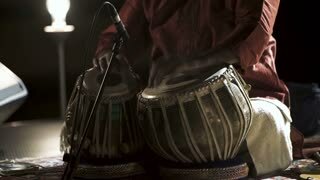 Man is playing tabla instrument. Wide shot of playing rhythm on clay doumbek with fish skin head. Closeup of playing fast drumming rhythm on metal Turkish daholla with arabic background. Playing rhythm on clay doumbek with fish skin head. Closeup of hands playing fast rolling rhythm on clay doumbek with fish skin head. Closeup of hands playing fast rhythm on doumbek drumming slow rhythm with arabic background. Belly dancer doing hip drops to a live middle eastern drummer in a dance studio. Belly dancer performing hip drops and circles in a dance studio. Arabic percussionist playing the rhythm beladi on the duhulla or bass doumbek. Closeup of a female Arabic percussionist playing the rhythm beladi on a decorated clay doumbek with fish skin head. Arabic percussionist playing the rhythm beladi on a decorated doumbek. A female Arabic percussionist playing the rhythm beladi on a decorated clay doumbek with fish skin head.